Instant Party | What is Karaoke? Karaoke - or Not to Karaoke, That Is the Question. Simply put, Karaoke is a musical presentation featuring backup singers and instrumental accompaniment, while you create the lead vocals from the lyrics presented to you on a screen. It's an opportunity to show off your musical skills. Karaoke offers ordinary people the opportunity to do something extraordinary . . get up on stage and sing with the backup of some of the best known musical groups in the business. Karaoke singers not only have great fun as they "do their thing" on stage, but they can discover a new avenue of self expression and confidence building. Some actually become stars among their friends & peers in the crowd watching. While It's more about fun, than developing a career, the beauty of it is that anyone can do it! Many cultural icons are known to show up at Karaoke shows & sing into the wee hours of the morning, because it's just so much fun! What's more, singing is good for you! See our article on singing and health Here. The word Karaoke was made up from two Japanese words, roughly meaning "empty-orchestra" The implication is the empty space in front of the orchestra that is to be filled by you, the singer. In it's modern technological development, karaoke will also supply the words, the rhythm, and cues for how the song is to be sung. For Karaoke, special enhanced compact discs called CD+Gs, (Compact Disc + Graphics) are the key. They differ from regular music CDs in two respects. 2.the lyrics to the song are displayed on a TV or monitor for the performer(s) to read. The words to the song change color in the rhythm of the music help the performer stay in time. The music portion on most CDGs is usually very close, if not identical to what you hear on the original CD. That makes it very easy for the amateur performer to give a great performance, and actually sound very good, even if they have just a little "talent." But truthfully, some of the most entertaining karaoke performances I have seen and heard, come from the "musically challenged!" It's all in fun anyway, and you will be surprised to see just how many people that are initially hesitant about giving it a shot, end up saying, "Just one more! And one more! And one more!" It really can become addictive! 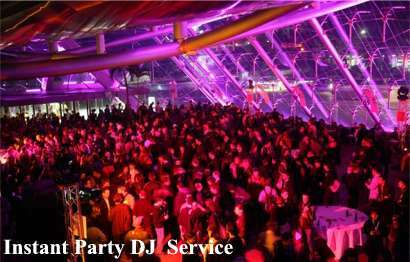 Instant Party DJ & Karaoke has over 9,000 Karaoke selections in every kind of music you can imagine, so there's always a song that you and your guests will know. See our Library of titles here. One of the best things about karaoke is that it allows your guests to become actively involved in your event. Let's face it, not all of us are great dancers, and many people are just unable to do a lot of dancing because of physical problems. Karaoke is a great way to keep your guests from "bailing out" early, because they never know who might get up next and decide to sing a tune! They want to stay so as not to miss anything. For more on the local scene, check out Southern MD Nights. Order your party here! or call (301) 509-3491.